Here’s the recipe you’ve been waiting for! Mix both boxes of vanilla instant pudding according to package directions. Blend in cream cheese then fold in Cool Whip (Alternate: you can make your own whipped cream too). Layer a small amount of cookie crumbs and a few spoonfuls of pudding (beginning and ending with cookie crumbs). Hint: I gently tapped each cups down on the counter after each layer to flatten. 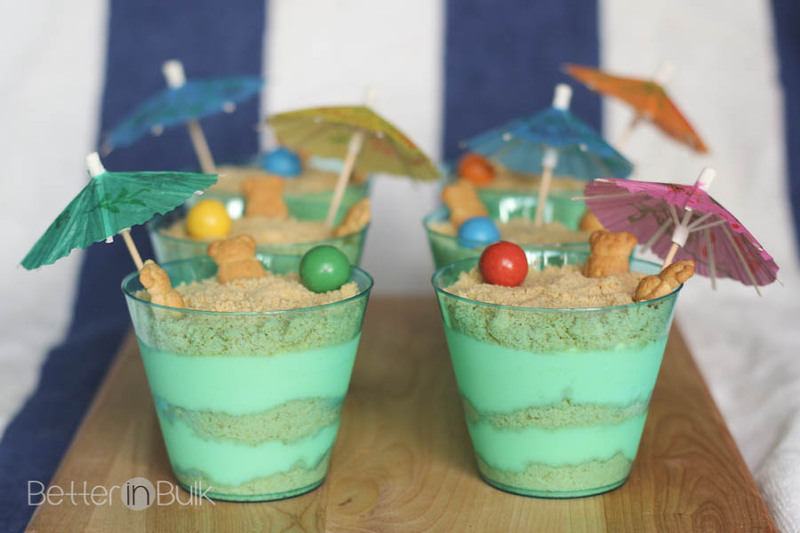 "Decorate" your sand pudding with mini umbrellas, teddy grahams, and a gumdrop beach ball before serving. Note: The two ingredients I kept seeing in most of the recipes I found were sugar and butter. I couldn’t imagine needing to add more sugar to pudding and Cool Whip so I left it out altogether. I also wasn’t fond of the idea of adding butter to my pudding. I mean…I wasn’t trying to make a healthy snack or anything but I try not to go to crazy with my treats. I don’t think we were missing out on anything. These sand pudding cups were delicious just the way they were! These sand pudding cups are so cute. The kids will love them. I’ve never made them pudding cups before, but I think it’s something they would really enjoy this summer. I would never even think to make a sand instead of dirt version!! Such a fun idea. These are adorable! Pinned & sharing on Twitter. Thank you for sharing on Merry Monday! Hope to see ya next week! We love the chocolate dirt pudding, but have not tried the sand pudding. It sounds delicious, we will have to give it a try. Thank you for linking up with us at the #HomeMattersParty this week! I’ve made similar pudding cups for my kids too and they loved it. It’s always fun to serve a cute dessert. Thanks for sharing on Merry Monday. These are so cute and great for summer time! Thanks for sharing. These are great! I love Pinterest projects and these are all so cute. I love these pudding cups. I’m preparing for a splish-splash-themed birthday party and this would be a great dessert for the kids. those pudding cups are so adorable and fun for summer! Thanks for linking up at Wonderful Wednesday! These are adorable. Can’t wait to see what you share next week! What a creative idea! I love the idea of eating “sand”. This looks super fun! I’ll have to add it to the summer bucket list! These look delicious and so adorable! I’d love to try and make them for my grandsons to enjoy! What a neat idea, looks so yummy! Thanks for sharing. I hadn’t heard of sand pudding before, thanks for the recipe! I have never made anything like this before but it’s super cute! the kids would love these. These are so much fun to make and look delicious! 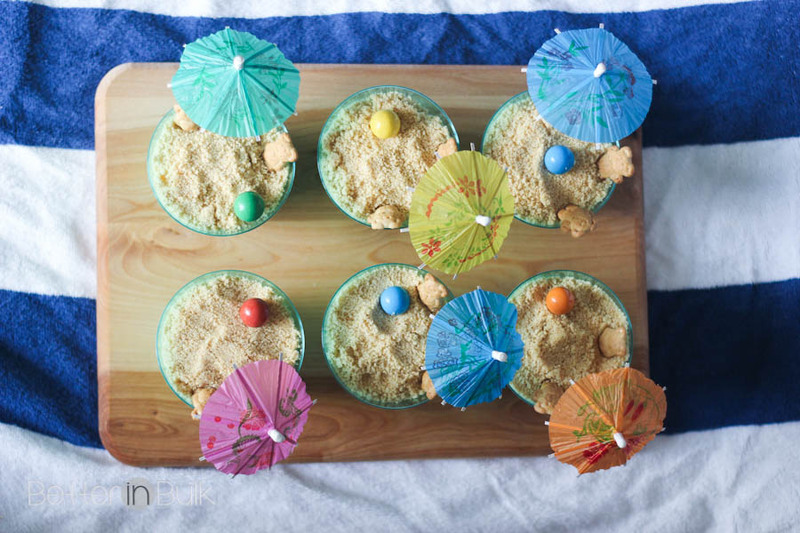 My niece and I would love to make these fun Sand Pudding cups for a Summer barbecue! Thanks for the recipe. These are so adorable, perfect for summer birthdays or even pool parties! I love the little umbrellas! That is so cute and would be perfect for my hubby who is allergic to chocolate! Oh my gosh I LOVE this idea! What a fun and creative dessert. I am going to make these this weekend. I remember the night we were browsing on Pinterest for dirt pudding cups. 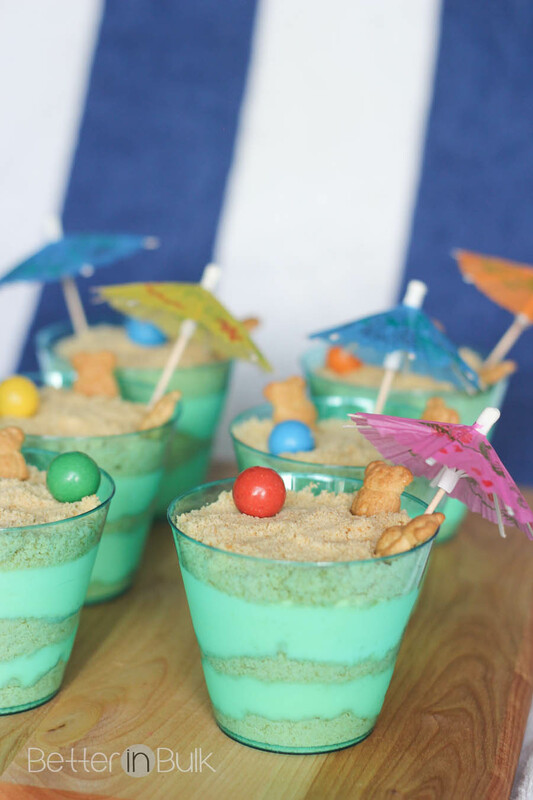 I LOVE these sand pudding cups. They turned out great and the beach theme is adorable. These are adorable! I love to make dirt cake but this looks like a fun way to change it up. I love how you used gumballs for beach balls. What fun! I love that you added the little teddy bears relaxing on the beach! So super adorable!!! What a creative idea. They are just perfect for summer gatherings.